Arriving on the North Shore, Robert Yacapin and his friends Ryan, Brandon and Brian discovered a group of shorecasters who had the same plan. Undeterred, they hiked farther up the coast and set up in a new place. 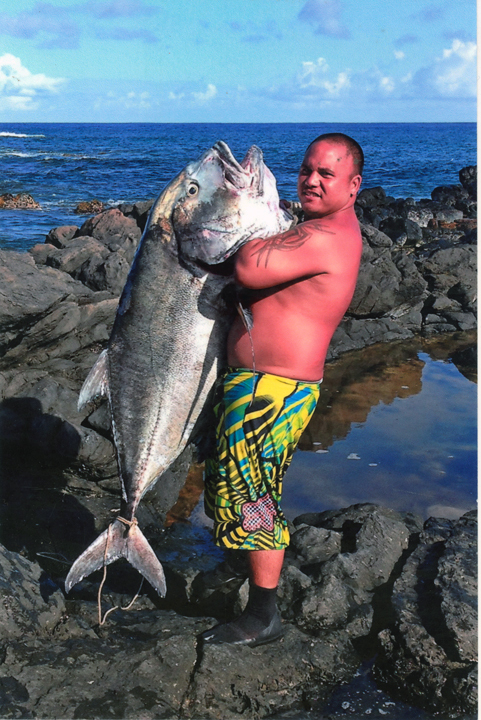 Robert took a strike at 8:30 p.m. and despite a nasty fall on the reef while running to his pole, he was soon engaged in an epic battle with a 112-lb ulua. The fish was no match for Robert's 13-foot Hawaiian Angler pole, 9/0 Penn reel and 80-lb test J-line. They weighed Robert's fish at Hanapa'a Fishing Supply in Honolulu.